This outings program tells the story of a 10 year old girl and her parents who went on a hike. With all the emphasis on getting more kids outdoors, it might be helpful to give them a role model. Listen to hear about a great one. 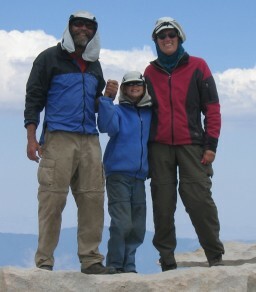 Mary "Scrambler" and her parents, Gary and Barbara, hiked the length of the Pacific Crest Trail in 2004. Their 2,650 mile journey started April 8th, and they were on the trail until October 25th. They talk about preparation for their journey, stories along the trail, and some of the more profound things they got out of the experience. Barbara Egbert wrote about the adventure, and included photos, copies of Mary's journal, drawings, and more in her book, Zero Days. Gary maintains a web site at pctfamily.com.